I know this is a really weird name for a recipe. Honestly picking recipe names might be the thing I struggle with most while food blogging! 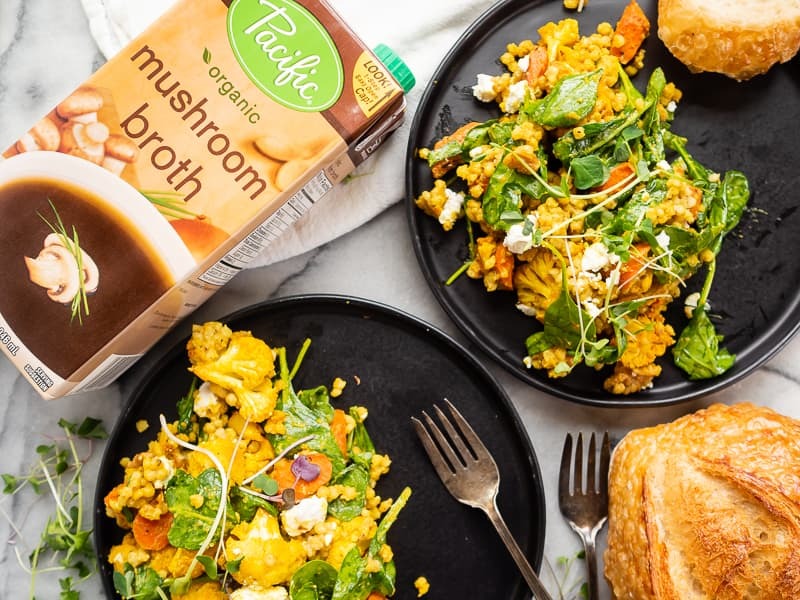 It’s full of vegetables (cauliflower, carrots, spinach), has hot sorghum cooked in Pacific Foods Organic Mushroom Broth (Hellooooo flavor! 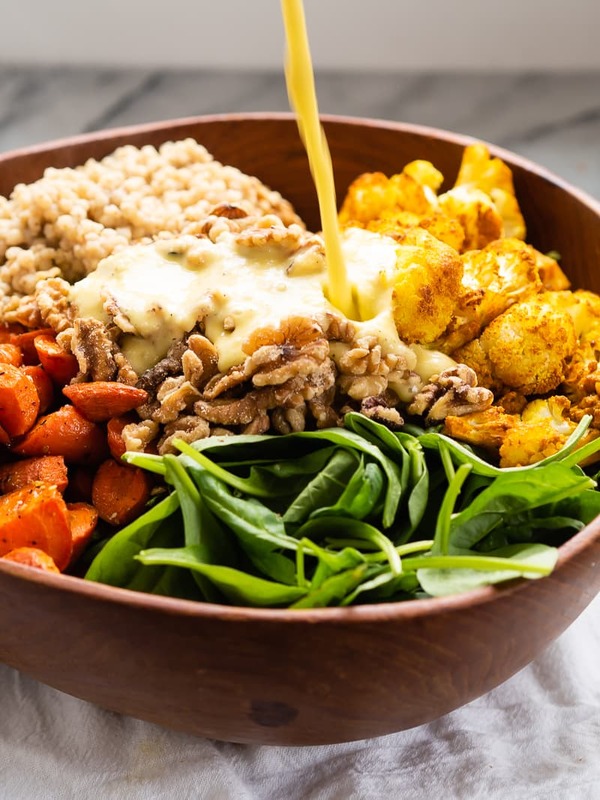 ), goat cheese, toasted walnuts, turmeric, and a fennel white wine vinegar dressing. It’d be kind of a mouthful (no pun intended) to include all of that in the title!! So, veggie forward sorghum salad? Hot grain and veg dish? Whatever. I went with hot sorghum spinach salad and it’s really freaking delicious. I’ve been making this salad all summer by using whatever vegetables I have on hand. I’ve used beets, broccoli, turnips, and others in place of the cauliflower and carrots! 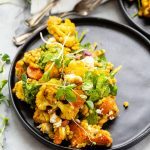 My favorite is definitely to include cauliflower roasted with turmeric, which then spreads to most of the salad and gives it that bright yellow hue. Also: goat cheese. Can’t skip it (or, I suppose you COULD sub a different tangy cheese). The reason I love this salad so much though, lies in the sorghum. It’s cooked in the mushroom broth, which gives it such umami, and really makes this a one-pot meal. I eat this as a complete meal and feel awesome about it. 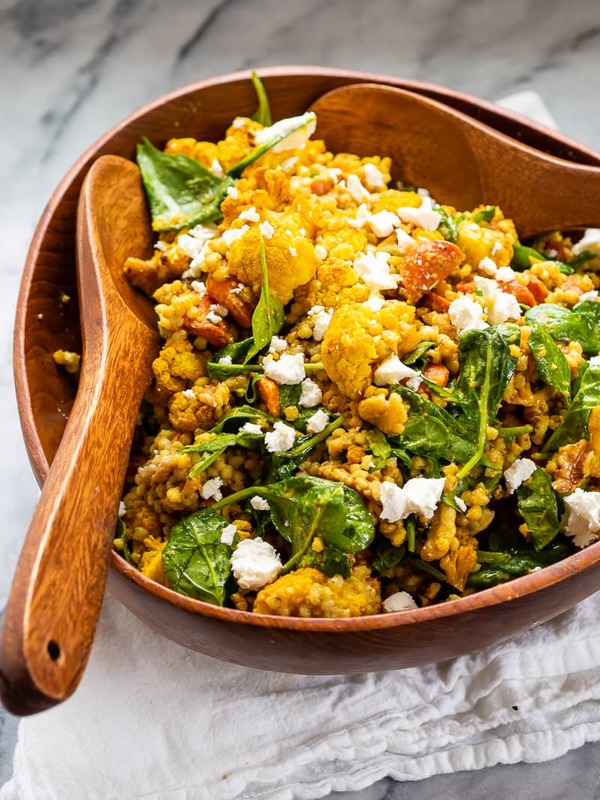 This veggie-filled salad has roasted vegetables and spinach, which wilts when you add the hot sorghum cooked in mushroom broth. Goat cheese and walnuts give tang and crunch for a filling, well-rounded meal. 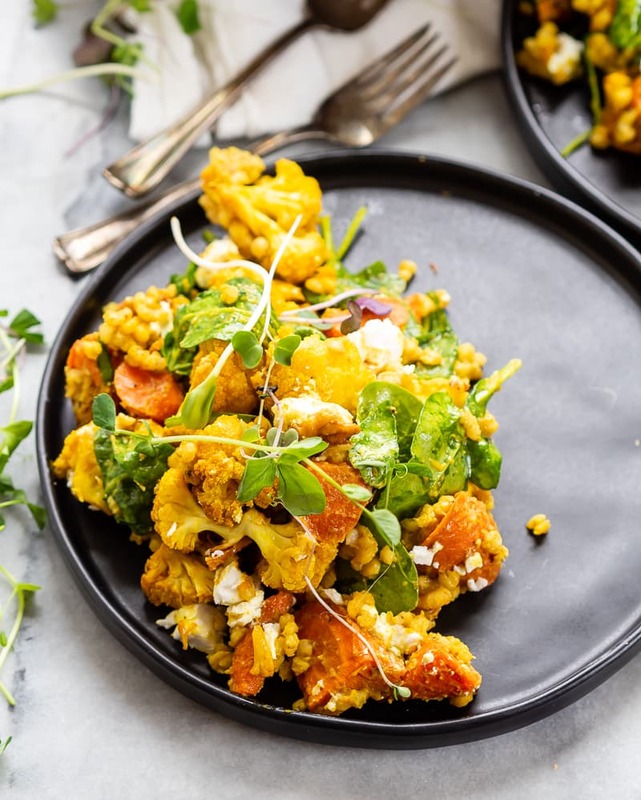 Toss the cauliflower and carrots (separately) with 1 tsp olive oil each, and a generous pinch of salt and pepper. 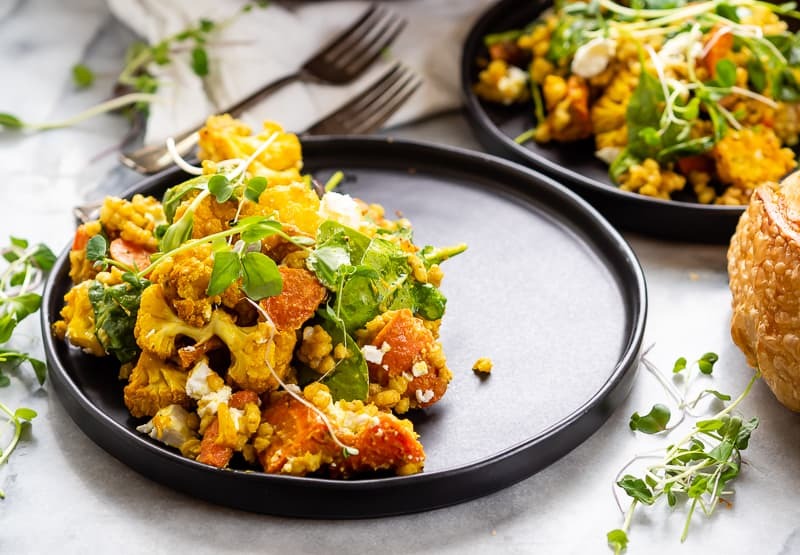 Add the turmeric to the cauliflower and mix until well distributed. Spread the veggies, again separated, onto two different baking sheets. Bake until fork-tender (20-25 minutes for the cauliflower, 30-35 for the carrots — could be less depending on how small you cut them). While the vegetables are cooking, bring the mushroom broth to a boil. Add the sorghum, cover, and let cook at a high simmer for 35 minutes. Prepare dressing by combining the remaining ~1/3 cup olive oil, white wine vinegar, lemon juice, and fennel. Blend with an immersion (or normal) blender until smooth. Add salt and pepper to taste. When the vegetables and the sorghum are done cooking, combine all of the ingredients together in a large salad bowl and toss to combine. What a gorgeous salad! I love sorghum (not as assertive as molasses and not so sticky sweet like honey) and it sounds like it pairs so well with all your ingredients!